Well , last year a Northern Cardinal showed up in a city yard and delighted local nature enthusiasts. The year before that, a Curve-billed Thrasher was way off course and hung around a yard in Dalmeny, not too far from town. 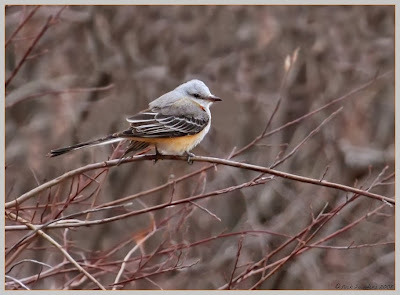 Taking the prize for the biggest surprise of 2008 ( at least so far ) has to go to a Scissor-tailed Flycatcher that was spotted on a Saskatoon Nature Society field trip yesterday at Blackstrap Lake. 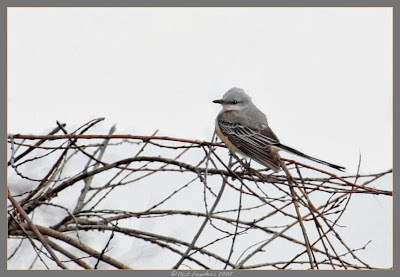 The only previous record of this species in the Saskatoon area was way back on the 20th September 1980. 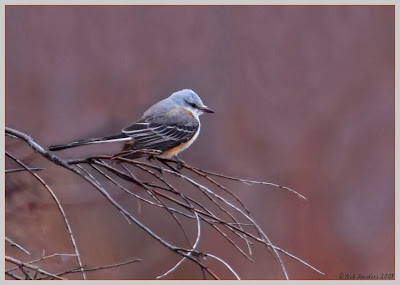 More commonly found in south-central United States and northeastern Mexico , this bird is also the state bird of Oklahoma. 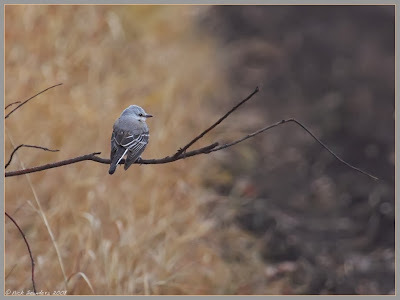 So, of course, upon hearing about this sighting , myself and 5 friends were not disappointed when, despite the overcast and rainy conditions, the bird was still in the same spot as yesterday! Lucky for you.Great looking bird. Thanks guys . It was quite a thrill to see one . Very pretty bird - like the coloring! Oh Nick, coming here and seeing your talent makes my mornings! He's beautiful!!! Great little bird, and very difficult to photograph. Nice shots. These are great! We had the thrill of seeing one in the Everglades last Feb...very exciting! Wow, great shots. Wonder how it got so far away from its home turf? Thanks John. We're thinking some of the recent high winds we've been experiencing may well have brought it in. I just hope it can get back south..